Experience the space program like never before in stunning HD video! Take a loop around the International Space Station aboard the shuttle Discovery in stunning high definition. Kepler planet-finder begins its mission to discover Earth-like worlds orbiting other stars in the galaxy. NASA's new lunar orbiter and impactor experiment are being prepped for launch in May. A Delta 4 rocket has rolled out to launch a new geostationary weather satellite. High definition from orbit! New clips from Endeavour's mission to the space station. Historical footage from the early days of the space program. A Russian Proton rocket lifted off from Kazakhstan early Saturday with a satellite that will broadcast television programming directly into homes across Indonesia and India. The workhorse booster blasted away from the Baikonur Cosmodrome in Kazakhstan at 0057 GMT Saturday (8:57 p.m. EDT Friday), tearing through the sky on nearly 2.5 million pounds of thrust. The Proton jettisoned its first stage two minutes later, leaving the second stage to burn for nearly three-and-a-half minutes. The launcher's third stage took over five-and-a-half minutes into the flight for a firing of more than four minutes, during which the rocket let go of its payload fairing that protected the ProtoStar 2 satellite as it flew through the lower atmosphere. The rocket's third stage placed the Breeze M upper stage and ProtoStar 2 on an arcing ballistic trajectory. The Breeze M fired up its hydrazine-fueled engine a little over 11 minutes after liftoff to place itself in a low-altitude parking orbit about 107 miles above Earth. A second burn one hour later raised the vehicle's altitude to more than 3,100 miles. The stage ignited three more times early Saturday to boost the satellite to even higher altitudes and reduce its orbital inclination. Separation of ProtoStar 2 occurred at 1012 GMT (6:12 a.m. EDT). The rocket was programmed to target a final orbit with a high point of 22,236 miles, a low point of 8,799 miles, and an inclination of 8.4 degrees, according to International Launch Services, the U.S.-based firm overseeing the commercial launch. ILS declared the launch a success Saturday morning. "We expected a flawless mission, and that is exactly what ILS Proton delivered," said Philip Father, CEO of ProtoStar. The 8,609-pound ProtoStar 2 satellite carries its own propulsion system to reach a final geosynchronous orbit 22,300 miles over the equator. The spacecraft will be positioned in a slot at 107.7 degrees east longitude in the geosynchronous belt, allowing it to reach customers in Indonesia, India, the Philippines and Taiwan. ProtoStar Ltd., headquartered in Bermuda and based in San Francisco, will operate the satellite for a variety of broadcasters in Asia. The company was formed to acquire and launch satellites and sell capacity to Asian direct broadcasting and broadband service providers. 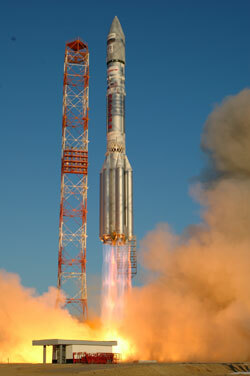 The company launched its first satellite in July 2008 to serve markets from the Middle East to Southeast Asia. ProtoStar 2, also called IndoStar 2, is outfitted with 13 S-band and 27 Ku-band transponders on a Boeing 601HP satellite platform designed to last at least 15 years. It is the 70th Boeing 601 model satellite to launch, according to Stephen O'Neill, president of Boeing Satellite Systems. The S-band payload will be leased by Indovision, Indonesia's largest direct broadcasting firm. Indovision will use ProtoStar 2's capacity to replace the aging IndoStar 1 satellite launched in 1997. Customers will be able to receive the high-power signals from ProtoStar 2 via small 65-centimeter, or 26-inch, dish antennas. ProtoStar 2 will double Indovision's capacity from about 60 channels to more than 100 channels, according to Father. "This is a critical payload for them and we're looking to continue to develop a long-term working relationship with Indovision and continue to bring more critical capacity over Asia," Father said. ProtoStar 2's Ku-band equipment will be shared between India, Indonesia, the Philippines and Taiwan, according to company officials. One Ku-band payload will use 12 transponders for direct broadcasting to India. Another switchable Ku-band system will provide broadband Internet access and other telecommunications services in Indonesia, the Philippines and Taiwan. The next commercial Proton launch is scheduled for late next month with the Sirius FM5 radio broadcasting bird for Sirius XM Radio Inc.
Another Proton will launch the AsiaSat 5 satellite in early August, according to ILS.